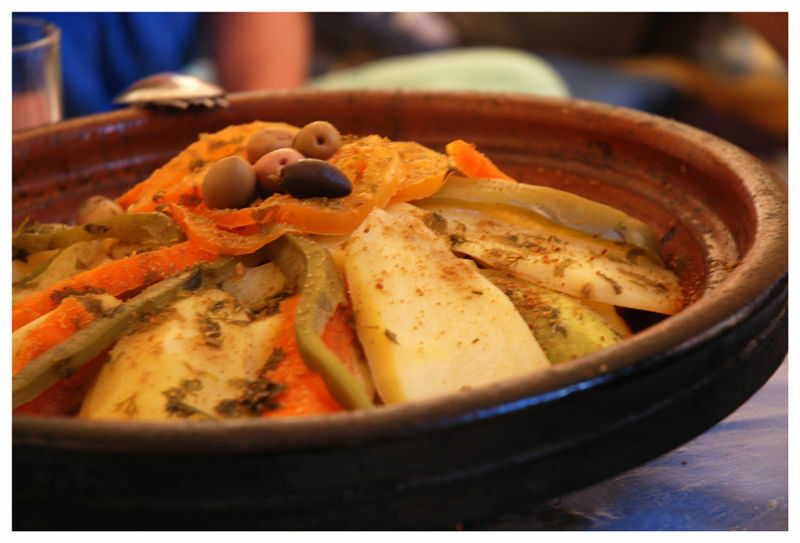 In case you are not familiar with Moroccan cuisine, a tagine is a stew, typically laced with fragrant spices, fruits and meat. In Morocco, a tagine pot (heavy clay pot with a cone-shaped lid) is set directly over coals, but you can use a saucier or Dutch oven on your stove. You might find a modern tagine pot with a cast iron bottom that can be used on top of the stove. Other alternatives include: a cast iron skillet with lid, a slow cooker, or a large covered casserole dish in a slow oven. This tagine stew is typically served with couscous (a steamed fine grain pasta), but can also be served with steamed quinoa or rice. I found this recipe in an insert of our local newspaper, The Daily Inter Lake’s “Spry” insert of October 13, 2009 (1). 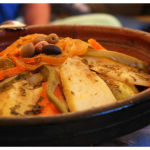 Check out also their vegetarian Harvest Tagine recipe (2), made with garbanzos. The list of ingredients for this recipe is fairly long, but the preparation is easy; it just takes time to braise. It uses legs and breasts, but you can also use just thighs or a mix of chicken pieces. If you use breasts, it’s a good idea to brine them first, to help them retain moisture. This has a bit of heat; if you’re not used to that, cut down on the cayenne. Brine chicken breasts for 30 minutes. Rinse and pat dry. Meanwhile, mince garlic into a small bowl and add spices. Chop onion coarsely; peel sweet potato and cut in 1/2″ – 3/4″ dice. Remove stems from figs, and cut each fig in half. Heat olive oil in cast iron skillet. Add chicken and sauté 2 – 4 minutes per side, until browned. Transfer to pot. Scatter garlic and spices over chicken. Tuck onion, sweet potato and figs around the chicken pieces. Add chicken stock to skillet and heat, scraping to loosen browned bits. Pour over chicken. Add orange juice, zest and honey. Cover and cook until very tender over simmering heat (or in a slow oven), at least 3 hours. Or simmer in slow cooker on low for 6 – 7 hours (or on high for 3 – 4 hours). When done, if the liquids have not thickened, remove chicken pieces and cook down the liquids a bit. Serve with couscous, a very fine-grained pasta, steamed to perfection; or Saffron-Raisin Quinoa if you have problems with gluten. Other alternatives are orzo pasta, steamed rice or bulgur. Serve with pita or other flatbread, and a dipping sauce of olive oil and cayenne. Check out my recipe for R’ghayaf: Moroccan Semolina Flatbread. This entry was posted in Citrus, Fat or oil, Grain, Herbs, Onion family, Poultry, Root Veggie, Spices, Stock, broth, Sweetener, Tropical fruit and tagged cayenne, chicken, chicken stock, coriander, cumin, fig, garlic, ginger, honey, onion, orange, sweet potato, turmeric. Bookmark the permalink.